This week the continuous Euro weakness was visible on all the charts. The Dollar strength was also apparent against the British Sterling, the Japanese yen and the Canadian Dollar. On the other hand, the Australian and the New Zealand Dollar proved to be even stronger than the US currency as we witnessed some big moves on both the Aussie and the Kiwi crosses. The Australian currency seems to be even stronger which is very clear on the uptrend behaviour seen on the AUD:NZD chart. On the Indices, and after Shanghai (new) big drop for the second time this year, the global side seemed to stay away this time. Gaining form the first Christmas shopping sprees, the recovery continued with both Europe and the US showing slightly higher values although still testing the highs from the previous weeks with no significant moves. In Asia, the Nikkei showed the exact same patterns while the Hang Seng didn’t present us with any major moves and is still holding around the 22500 level. On the commodities side, Gold stayed within the downtrend from the previous month and price is now reaching the lowest levels for the past 5 years. As for Crude the price is still holding at around 42 after last week drop. 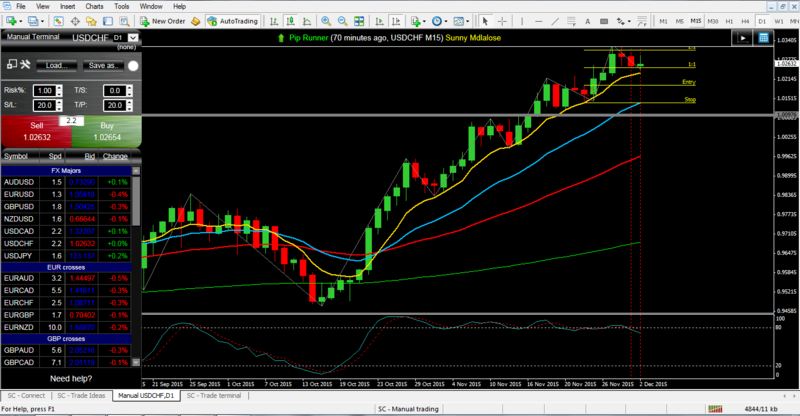 USDCHF (Daily Chart) – Continuation Long – 24.11.2015 – After retesting the parity level, the Swiss Franc kept getting weaker against the US Dollar. The low test bar bouncing of the moving averages on the 24th was yet another perfect reason to place another trade. Currently at around +1% profit and still looking to go further. It is going to be a major week in terms of trading action as most of the pairs are either looking to continue to the latest trends or sitting on significant levels of previous support or resistance. As the news keep coming in we strongly advise to act accordingly and protect your capital.